With its sleek, minimalist design and innovative functionality, Sunpan's California Adjustable Bar Stool is the perfect accent to the ultra modern kitchen or bar space. This contemporary adjustable bar stool's design starts with a sturdy, pedestal style steel base enhanced with a footrest for added support and a high shine finish for captivating luminance. A backless, minimalist seat made from clear acrylic give the stool its modern edge while subtle curves ensure your visit to the bar is comfortable and relaxed. For added function, the California Adjustable Bar Stool comes equipped with a hydraulic lift that adjusts the seat height for optimal comfort and to accommodate various bar and counter heights. 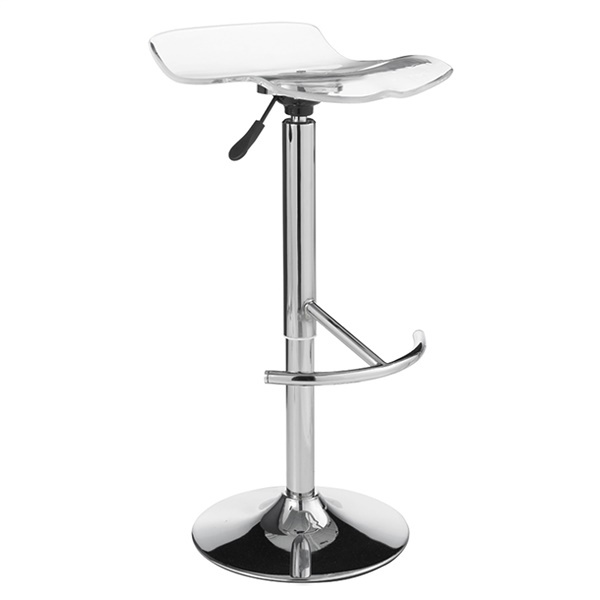 The California Adjustable Barstool does swivel on its base.